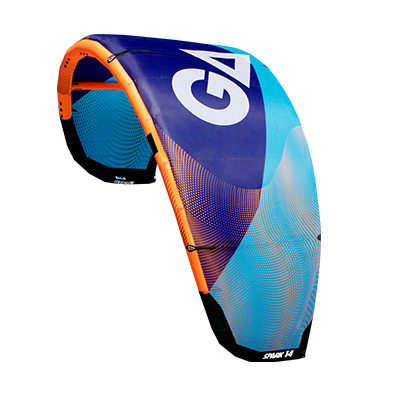 For 2017 we focused on making the Spark the best handling freeride kite which allows you to ride to your full potential in waves and big jumps! It´s new light-weight three-strut construction ensures very stable flight characteristics and easy control. We added new reinforcements on the leading edge and added a lighter double spinnaker frame along the trailing edge. A new profile of the kite ensures a more exact pressure point and better barfeeling. This means the spark provides the rider with progressive bar pressure and direct feedback about the position of the kite. Extreme easy relaunch by just pulling one side of the bar! The kite is designed for all conditions and is characterized by its early low wind and high depower abilities. Fast reactions on steering impulses combined with an enormous amount of hangtime will set a bench mark in big air freestyle. The Spark features predictable pop which invites advancing riders to lift off. Stable drifting while lines are slack ensure perfect handling when wave riding. For these reasons you will love your 2017 Spark! WHAT’S GOOD ABOUT THIS KITE?